An order that is processed before 23:00 will be shipped the same day. We ship 6 days a week, Sunday till Friday. For delivery of the products, we work with Active Ants in Nieuwegein. What happens to my order if I am not at home? If you are not present at the time the package is delivered, you will receive a notice. On the website of the carrier, you can then specify when it comes to delivery. Yes, you can. You can specify a different delivery address for your order in “My Account” or during the checkout process. The store also provides orders overseas? Yes, we deliver within the EU. If you’re in the shopping cart and click on the “proceed to checkout” button, you get an overview of the total price and the shipping cost for your order. I have not received my order on the agreed date. Now what? Your order will be delivered within 5 working days unless otherwise stated. If you have not received your order, you can contact our customer service. What to do to cancel or return the products? Cancellation of an order is free as long as it is not yet on your way. If you cancel the order after it is on your way, you should refuse the package at delivery. If we already received a payment from you, we will refund your purchase price as soon as possible, but no later than 7 days after receipt of the cancellation notice. We can wait for refund until we receive the products, or until you have shown that the products have been shipped. You are solely responsible for the impairment of the goods resulting from the use of the goods, which goes beyond what is necessary to determine the nature, characteristics and operation of the goods. Should this be the case, we may deduct the damage from the amount due. Consumers have a 30-day cooling-off period to return the product without giving reasons, starting on the day of delivery. You can use the revocation form. You must submit the form within 30 days of receipt of the order, by email. From the moment you submitted the form, you have 14 days to send the product back. The product can only be returned unused and returned in the original, undamaged packaging. Do you want to return the entire order? Then return the items already received to the following return address. Buchu Trading will repay your entire purchase price, including the calculated shipping cost. The shipping costs for the return are for your own account. Also, when returning part of your order, the shipping costs will be for your own account. The purchase price of your returned part of the order will be refunded to you. The shipping costs calculated in the order will not be refunded. All cancellations, exchanges and returns must be notified in writing to Buchu Trading. This can be done by email or postal mail. In this case you must state your full name and invoice number. For repayment of amounts already paid by you (in advance), we also need your bank account number. 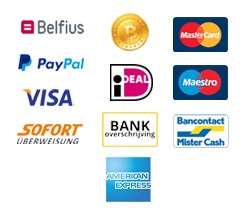 Customers from outside The Netherlands should also mention the IBAN and BIC / Swift number of their own bank. Please note: The account number you provide for the refund must be equal to the account number you made the payment to Buchu Trading. Any amounts already paid will be refunded to you within 14 days after dissolution.